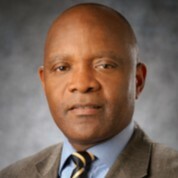 Dr. Nkengasong Director of the Africa Centers for Disease Control and Prevention. Until recently, he served as the deputy principal director (acting) of the Center for Global Health, United States Centers for Disease Control and Prevention (U.S. CDC). He received a Masters in Tropical Biomedical Science at the Institute of Tropical Medicine in Antwerp, Belgium, and another Masters Degree in Medical and Pharmaceutical Sciences at the University of Brussels School of Medicine and a Doctorate in Medical Sciences (Virology) from the University of Brussels, Belgium. Between 1993-95 he was Chief of the Virology and the WHO Collaborating Center on HIV diagnostics, at the Department of Microbiology, Institute of Tropical Medicine, Antwerp, Belgium. He joined the U.S., CDC in 1995 as Chief of the Virology Laboratory, U.S., CDC Abidjan, Ivory Coast. He has received numerous awards for his work including, but not limited to, the U.S. Secretary of Health and Human Services Award for excellence in Public Health Protection Research, the Sheppard Award, the U.S. Director’s Recognitions Award and, most recently, the William Watson Medal of Excellence, the highest recognition awarded by CDC. Awarded for outstanding contributions and leadership in advancing global laboratory services and programs to support the President’s Emergency Plan for AIDS Relief. He is also recipient of the knight of honour medal by the government of Cote d’Ivoire, and was on June 19th, 2017 knighted as the officer of Loin by the president of Senegal, H.E. Macky Sall, for his significant contributions to public health. He has authored over 200 peer-review articles in international journals and published several book chapters, and served on various international advisory boards.